Pampers are one of the biggest parenting/baby brand names around and UNICEF is one of the biggest children's charity names out there. So when they team up to help eliminate newborn tetanus through their 1 pack = 1 vaccine campaign, you know they mean business! I've been using Pampers nappies since the day Isla was born. They are such a well trusted and recommended brand, that I didn't even consider any others and we have no complaints so far! Unfortunately there are still babies at risk in another 24 countries and it's our job to try and help them. We want to spread the word and help more babies reach all the 'firsts' that our babies do. Pampers and UNICEF want us all to share our babies firsts and in doing so raise awareness for this great campaign. They have even got the fab (my fave Spice Girl) Emma Bunton on board as an ambassador for the 1 pack = 1 vaccine campaign. She has travelled out to Madagascar (who have just announced they elimination of newborn tetanus in their country) to see the work that's been done there already. 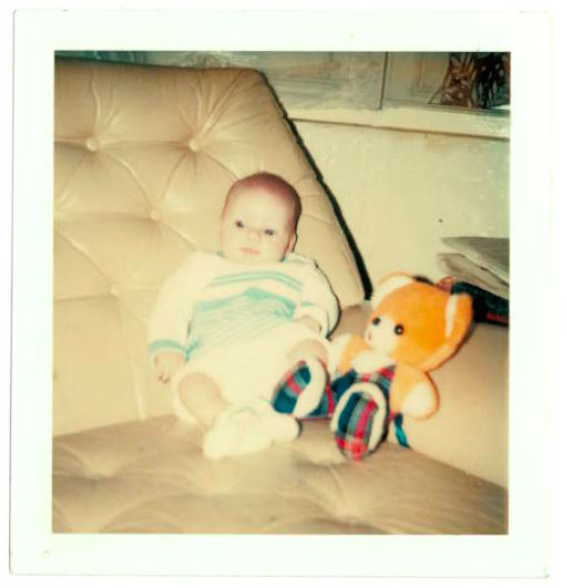 Emma shared a special photo of one of her 'firsts'...how cute is she with her first teddy bear?! Here's a video of her out there. Again 1 view = 1 vaccine, it's so easy! As another little added bonus, here's a little video of a selection of my little one's firsts. Would mean a lot for you to take a look! Together we can help all babies around the world reach the firsts they all deserve to. I'd love to see any pictures/videos of your baby's firsts, they're all so special! This post & those videos made me shed a tear. It reminds me how lucky I am to have Sophie and how lucky she is. Let's hope Pampers send lots of vaccines due to this campaign.